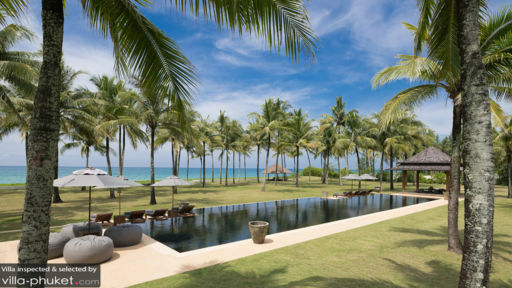 Villa Ananda is part of the luxurious Jivana Estate on the popular stretch of Natai beach, with a peaceful beachfront location, which is more or less deserted for use by the guests of the villa. The seven bedrooms at the villa are housed in separate pavilions thus, offering guests much-coveted privacy and exclusivity. There are even separate children residences in one of the four main pavilions, along with a well-furnished living and dining space where everyone can gather. 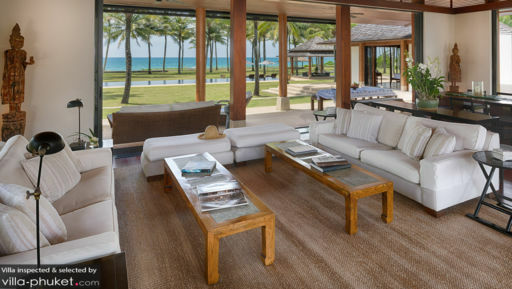 The villa comprises four pavilions, of which two house the bedrooms for guests. The first pavilion has four bedrooms, the second pavilion has the master bedroom and an office, and the third pavilion is home to the children’s bedrooms. Each bedroom has been decked out in comfortable double beds, wooden interiors, spectacular ocean views, and large glass doors that lead to the pool! There are bunk beds in the children’s room and the same pavilion also houses a nanny room, if needed! There are en-suite bathrooms in each of the bedrooms that are fitted with bathtubs and are partially open-air in some! 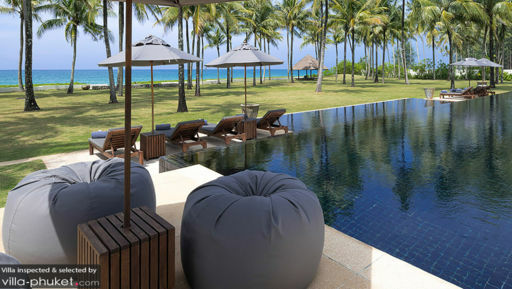 Bordered by the pavilions that are home to the bedrooms at Villa Ananda, ensconced by lush tropical greenery including swaying palm trees, and stunning foliage, a 25-metre swimming pool with a magnificent black-tiled bottom spills into a nearby children’s wading pool with shallow waters suitable for kids. While you lounge in the big pool or on the sun chairs found beside it, the kids can safely splash around in their own pool without a moment’s worry. There are salas that house individual sitting/dining areas on the vast property for everyone to enjoy a good meal while watching the sunset! The direct access to the beach is another notable feature as you can enjoy the sandy shores all to yourself since not many people can be seen in the area! A gorgeous landscape with lotus ponds and soothing waterfalls, as well as the tranquility of being away from the crowds is just what you need for the perfect tropical cocktail! The living area at Villa Ananda is termed, rightly so, as ‘The Great Room’, for its spacious, open-concept layout which allows for natural lighting and the ventilation all throughout. It is designed to offer a luxurious and comfortable fair to guests, a place where they can all collect and relax on the plush sofas, chairs, and ottomans. The rich, wooden interiors create an opulent ambiance in which to lounge in, and so does the muted lighting. Since you can clearly observe the great outdoors from the room, it will be hours before you call it a night and move to the bedrooms! There are several dining options at the villa including alfresco and the ones inside the living area. There is a ten-seater dining table, as well as a four-seater table for guests to dig into their meals comfortably. Another pavilion houses the kitchen and the staff rooms, and the kitchen is fully-equipped and ready for use with its modern facilities! With a great team of people to look after your needs at the villa, assuredly your stay will be a wonderful and memorable affair. Welcoming you with the hospitality so intrinsic to Thai heritage, they will take care of the maintenance and housekeeping of the villa. They can prepare delightful meals, if you wish, at an additional charge and surely you will fall in love with the food! The villa is perfect for those who are looking for a respite from their busy lives since the area is frequented by few giving you complete access to the beach. Natai beach is a quiet and clean stretch of golden sand and the ocean is conducive to a great time! There are beach bars where you can grab a drink or two after splashing around in the water!